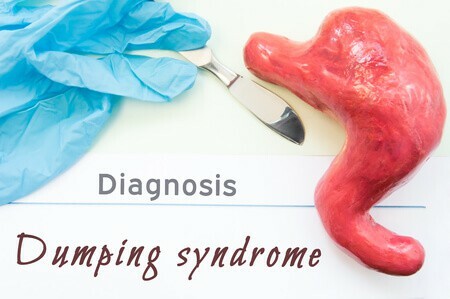 Dumping syndrome, also known as rapid gastric emptying, is a complication that follows any surgery in which the stomach is partially or wholly removed or bypassed. The manifestations of this syndrome result from rapid entry of partially digested foods, most importantly sugar, from the stomach into the small intestine. The stomach serves as a reservoir for food and within it; the food undergoes both mechanical and chemical digestions. The mechanical digestion is made possible by the peristaltic movements. This results in thorough mixing and churning of the food. The chemical digestion is achieved by the enzymes and acidic environment of the stomach that partially break down the food into smaller molecules. The duration of stay within the stomach depends on the type of food ingested and is longer for solid foods compared to liquids. The normal anatomy of the gut allows the partially digested food from the stomach to enter the initial part of the small intestine (duodenum) gradually through the pylorus (the part of the stomach adjoining the duodenum). The junction has a sphincter (pyloric sphincter) that prevents rapid dumping of the stomach contents into the duodenum. This allows the small intestine to only receive a few food particles that it can conveniently handle at a time. Gastric sleeve surgery patients are at risk of experiencing dumping syndrome as the surgery involves the partial removal of the stomach leading to a reduction in its capacity. However, the stomach is not bypassed, and the foods still pass through the regular route into the small intestine. This is in contrast to gastric bypass surgery where the pylorus of the stomach is bypassed. The clinical features of dumping syndrome are the result of rapid emptying and rapid absorption. The early symptoms and signs occur about 30 minutes after eating. It includes; nausea, epigastric fullness, vomiting, abdominal cramps, and diarrhea. The rapid entry of high osmotic food contents into the stomach draws-in water from the intravascular compartment into the intestine leading to distension and irritation that is manifested by the above symptoms. The late features are seen after about 1-2 hours of a meal. The rapid absorption of sugar (glucose) into the body system triggers the secretion of a large amount of insulin into the bloodstream which in turn stimulates tissue uptake of the available glucose leading to a reduction in blood sugar (hypoglycemia). Therefore, the late features are those of hypoglycemia and they include; hunger, tremor, excessive sweating, palpitations, headache, dizziness, and inability to concentrate. Ramadan et al. conducted a study that involved 541 patients from five different centers in France. Some of these patients had laparoscopic gastric sleeve surgery while others had laparoscopic gastric bypass surgery (Roux-en-Y gastric bypass). The study was to determine the risk of dumping syndrome following these two surgeries. An assessment was carried out after one month and six months of surgery. The overall incidence of dumping syndrome in both groups put together was 8.5% at both one month and six months after the surgery. However, only 1.49% and 1.12% of those who had laparoscopic gastric sleeve surgery had dumping syndrome at one month and six months respectively. These figures were tiny when compared with incidences of 17.90% and 18.78% at one month and six months respectively in gastric bypass patients. The diagnosis of dumping syndrome is majorly based on history but could be complemented with oral glucose provocation tests.1After about 10hours of fasting, the patient is given oral glucose (50g), and the heart rate is monitored. An increase in the heart rate by ten beats/min within the first one hour of glucose ingestion has been shown to be highly sensitive and specific for the diagnosis of dumping syndrome. The treatment of dumping syndrome following gastric sleeve surgery relies on modification of diet with certain dietary habits. A small quantity of food should be taken at a time. Foods containing refined sugars can accelerate the symptoms of dumping syndrome and therefore should be avoided. The patient is also encouraged to take high fiber diet which will be absorbed slowly. Drinking and eating should be done at least 30 minutes apart, and alcohol intake should be avoided. Medication such as octreotide may be prescribed for this group of patients. The drug has been shown to inhibit the release of some of the vasoactive peptides that are implicated in dumping syndrome and prevents the development of dumping syndrome. In conclusion, dumping syndrome after gastric sleeve surgery is not a common occurrence. However, when it occurs, it can be managed by dietary adjustment and habits. The use of medication octreotide has also shown a positive result. Ramadan M, Loureiro M, Laughlan K et al. Risk of Dumping Syndrome after Sleeve Gastrectomy and Roux-en-Y Gastric Bypass: Early Results of a Multicentre Prospective Study. Gastroenterology Research and Practice. 2016;2016:1-5. doi:10.1155/2016/2570237. Van Der Kleij F, Vecht J, Lamers C, Masclee A. Diagnostic Value of Dumping Provocation in Patients after Gastric Surgery. Scandinavian Journal of Gastroenterology. 1996;31(12):1162-1166. doi:10.3109/00365529609036905. Geer RJ, Richards WO, O’Dorisio TM, et al. Efficacy of octreotide acetate in the treatment of severe postgastrectomy dumping syndrome. Annals of Surgery. 1990;212(6):678-687.